This is Part Two of the continuing saga of my rookie experiences in buggying. I was lucky enough to have a few days off just before the East Coast Sport Kite Competition. The three days preceding the sportkite competition is when the Wild Wheels Buggy Blast takes place. I had three great days of new learning experiences, new friends, and lots of great memories. Some of the things I’ll always remember: Corey getting pulled out of his buggy for the first time in 7 years. Yes, he made no bones about it. I also got pulled out for the first time, well, first time in my 9 month buggy career. I did learn a few things about getting pulled out of a buggy – if you are going to get pulled out, make it spectacular and, at all costs, avoid getting pulled out near ‘home base’. On one of my wipeouts I did everything wrong. We had a very nice breeze and I was doing great with the 4 meter. Buggying back to our starting point (home base) under power was a new experience for me. I came roaring back, slowed down, and was ready to stand up. I lost track of the kite – trying to look and act really cool was not a factor. I very slowly got rolled out of the buggy and onto my stomach, struggling all the while to regain control of the kite. When I finally stood up, everyone that was around home base gave me a standing ovation – so much for looking cool! Dean yelling encouragement to us slackers in the failing wind: ‘Don’t walk back! Don’t walk back! Don’t walk back!’ It’s a little bit tiring and not much fun to struggle back upwind, but you will learn several things – how to buggy better, how to read the wind better, how to choose kites better, and you will learn when you should be back at home base shooting the breeze. Well this may seem to be a repeated comment, but picking the right size kite for your weight and wind conditions can make all the difference when you are out expecting some fun. It’s no fun having just barely enough pull to ‘pump’ yourself back up wind. It always seemed that I needed the next larger sized kite than others of a similar skill level. Finally I figured out a system. Check what size the ‘light-weight hotdogs’ are using and this was the proper size for me. The ‘hotdogs’ are generally a bit overpowered for their size, but for me it was just perfect. Too late to enjoy at Wildwood, my 5.6m Quadrifoil Q2005 finally arrived. The 5m and 4m will become staples in my kite bag. Okay, I hear you saying, I’m not 6’7″ and 275lbs – what about me?’ I understand and can almost sympathize. My son is only 150lbs soaking wet. The biggest concern for him is being overpowered. 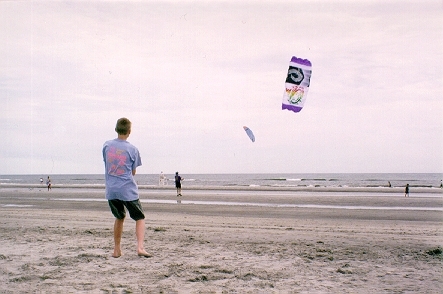 Just before we left for Wildwood, we received a small kite (Quadrifoil Q2002) with him in mind. We didn’t get a chance to fly it before we left and the first time I saw the Active People folks flying the Q2002s as demos I thought – it looks like a toy. It’s very quick, but so tiny! I still hadn’t flow it yet and I felt that even though it would never serve as a ‘real’ buggy engine, it would still be useful as a learning tool. Then to my delighted surprise I noticed my buddy Glen (175 lbs.) actually buggying with it. He was really moving. I was using the 4m at the time and was very surprised to see him zipping up and down the beach with this ‘toy’ engine. My son uses it all the time and it will become his primary engine. My advice is to try a lot of different sizes before you buy. Pick something in the middle of your range. Skytiger makes a bewildering variety of sizes, some differ in size by only 2 square feet, so picking the proper size should be an easy task. Try out your friend’s kites or contact any of the distributors like Active People or Cobra Kites. Find out what event in your area they will be attending and go take a test drive. The seat on a Peter Lynn folding buggy is just the right size for my hinder. It’s big. The only complaint I have pertains to the rear bar that makes up the seat frame. When you lean back hard that rear bar hits you in the lower back, causing lots of bruising. I wasn’t using a harness and this may be partly to blame for the discomfort I experienced. My solution was to try some foam pipe insulation – way too thin. I ended up buying one of those foam pool noodles with a hollow core. It was the perfect size to fit over the bar. Only a short piece was needed to fit between the two straps. This is nice because I was able to experiment and fix my mistakes. I ended up covering the foam tube with nylon bandage tape to keep from tearing the foam down to the bar. The tape worked well. Several folks suggested that I try one of those high performance car shops for some tougher roll bar foam or some padding from a BMX bike. The side rails on the Peter Lynn folding buggy have a small hole in the end that slips over a solid rod. The riders weight in the seat is supposed to keep the two opposing sides pulled tightly onto the rods. When I got sideways a little too much, the side bar would pop off leaving me unsupported. This usually occurred when the wind was blowing fairly hard – not a pleasant situation. I was able to lock the side rails in place using a couple of nylon cable ties. One cable tie is sacrificed each time you need to fold the buggy. Another suggestion I received from Brian Smith (Active People) was to drill a hole through the rod and use a quick release ring pin (spring cotter pin) to hold the rails on. When you are just learning to buggy, avoid buggying on narrow beaches with the wind blowing offshore. I’m talking about situations where the kite is out over the water. I spent a lot of time trying to get the water and sand out of my kite. On Quadrifoil Q2000s, the two outermost cells are closed on the front of the kite and get inflated by cross-vents. This design feature was obviously implemented to enhance performance, but also makes it very difficult to get water and sand out when you crash in the surf. My 3 and 4 meter kites were so filthy after Wildwood, I had to wash them in the shower when I got home. I pinned the kites on the clothesline, leading edge down, and squirted a garden hose up into each cell. They look pretty good now. The beaches of Wildwood are composed of very fine-grained sand that packs down to a concrete-like consistency. Last October the entire beach was hard packed and perfect for buggying. This past May the city of Wildwood spent lots of time grooming the beaches. The major effect of this grooming was that they fluffed up the sand all they way down to the surf line. They even groomed the designated buggy field! Fortunately the offshore breezes pushed the tide way out and created a fairly decent buggy area. If you got going too fast, just head for the soft sand – instant brakes. The guys from Active People brought a Peter Lynn Big Foot buggy. All I can say about it is TRY ONE! That buggy will go over or through anything. The only problem I saw was that some of the lighter buggy pilots had trouble with bouncing. The tires are really big. I think the bouncing problem can be handled by reducing the air pressure. I watched Brian Smith drive through a four foot deep tidal pool. It looks so cool when only his head was above water. I also saw some Roll-eze converted buggies that worked well on the soft stuff too but the Big Foot is the monster truck of buggies. The wind and beach conditions at Wildwood may have had some effect, but the competition seemed to me to be a bit unorganized and only for the veterans. The first race was a closed course of three laps with three heats. I knew the race was starting because people started yelling at me to get off the course. I could only conclude that this sport needs to make some room for novices. I have no idea if there are any published rules. I’m sure that there are at least some US guidelines, but I’m not aware of any. I’ve since spoken to some of my British friends; they informed me of their buggy organizations, the British Buggy Club and the ParaKart Association. Check out their WWW sites. They have a lot of great information, pictures and some very good guidelines. Buggying seems to be a bit more organized over in the UK. All of their race events have a novice class. You guys who have been buggying for a while should consider making some room for novices. This will involve some sacrifice, but the sport will only grow as newcomers are welcomed into it. This entry was posted in 1998, Issue 5 (Sep/Oct), KL Archive and tagged competition, kite buggy, Quadrifoil.